The deadline for the October 2018 issue is September 10. We welcome story submissions from 300 to 400 words long. Accompanying photos must be high resolution in a jpg file at least 1 MB large and include a photo caption and the name of the photographer. Categories: Past Issues | Tags: Collingwood Corner, Collingwood Neighbourhood House, RCC News 20 years, Renfrew Auto Camp, Renfrew Ravine Moon Festival, Sarah Ross House temporary modular housing, Vancouver municipal election 2018 | Permalink. 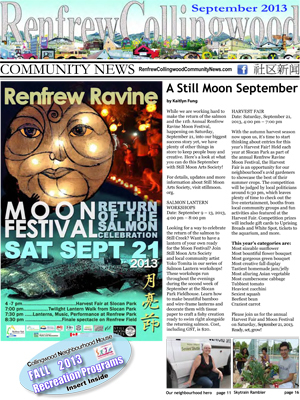 With fall fast approaching, Still Moon Arts Society has been preparing for the 15th annual Renfrew Ravine Moon Festival, held this year on Saturday, Sept. 30. The Renfrew Ravine Moon Festival is a signature festival that celebrates the full moon and harvest abundance, while honouring diverse cultural traditions. The festival will highlight art, music, environmental stewardship and community participation. This year’s theme, Migrations, allows attendees to reflect on the global movements that occur every day, from the smallest of salmon fry to the largest of humans. Birds journey across land and sea to discover new places and build their nests; salmon and fish swim across vast oceans to spawn new life and continue the survival of their species and others; humans flow within and across boundaries to pursue new opportunities, reunite with loved ones or find safety. With the current issues in our world, these systems of movement have played a significant role in people’s identity and relationships. As you yourself move through the festival and experience the installations of this year’s event, we invite you to discover your own stories and how you relate to this year’s theme. The event gets under way with the Harvest Fair, which will feature live music, food and a booths from local organizations, artisans and non-profit groups. Another featured activity is the Harvest Fair, a home-grown harvest competition, which features entries by local gardeners of some of Renfrew-Collingwood’s best fruits, vegetables and flowers. Enter for a chance to win some awesome prizes! The Twilight Lantern Walk begins with a moonlit parade from Slocan Park to Renfrew Park. Festival goers light their own lanterns and walk the trails along the ravine, accompanied by live music as darkness falls. Passing by the river-stone labyrinth, the procession will be invited to a walking meditation surrounded by music and light. The parade then passes by various art installations and surprise performances until it reaches Renfrew Park. At nightfall, time slows down as participants absorb the beauty of candlelight, exquisite lanterns, ethereal music and the shimmering stream. Just outside of the stream, you’ll find musicians playing at the main stage, a Tea Garden full of delicious treats for you to enjoy, and a finale spectacle featuring dancing, stilting, fire spinning and fireworks. For more information, visit stillmoon.org or our Facebook page, @stillmoonarts. June Lam is the communications coordinator at Still Moon Arts Society. She graduated from the Leadership Program at Windermere Secondary and is currently attending the University of BC. She is also an avid volunteer and has been involved in the Renfrew-Collingwood community throughout her high school career. Categories: Arts & Culture, Health & Wellness, Intercultural Stories, People, Sports & Recreation | Tags: Harvest Fair, Harvest Moon Festival East Vancouver, Lantern Festival, Renfrew Ravine Moon Festival, Slocan Park, Still Moon Arts Society | Permalink. Get your September 2013 issue of the RCC News at your local coffee shop, grocery store, library and community centre. Tips to start your own family tree – Begin at the beginning! Do you have a local story to tell or an event to share? We’d love to hear about it! Email rccnews-editorial@cnh.bc.ca. The deadline for the October issue is October 10, 2013. Categories: Past Issues | Tags: back-to-school lunches, Diane Crowder, fall recreation programs, family tree, Farmers Markets, Harvest Fair, Julie Cheng, Renfrew Ravine Moon Festival, Renfrew-Collingwood Interculturalism, Seniors' painting project, Slocan Park, Still Creek, Still Moon Arts Society | Permalink.